This post is going to get a little technical. I know this will turn some of you on, and if that is the case, perhaps wait until the quite of the evening, when you are with a close confidant, or maybe just by your happy lonesome. We needed to haul the boat out of the water and get new anti-fouling paint. Desperately. 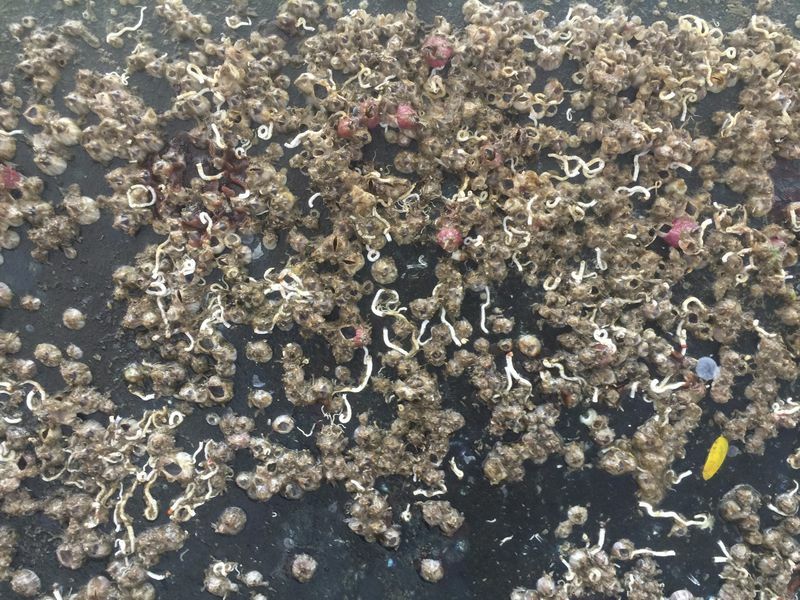 These fish eating the barnacles could not keep up! So after a God inspired moment when I just handed over our boat to winds, helping hands, and scary as hell fate while docking, we were hanging in the slings at the boat yard. The bottom was pretty bad, covered head to toe in barnacles. The poor prop was mauled by the suckers, impacting our motoring performance so much that at one point while moving the boat I thought our forward gear was broken. That isn’t a good feeling, having no forward gear while drifting back towards other boats in a marina. Not good at all. Once all of these beauties were scraped off, which was surprisingly easy, we took a hard look at the blisters. These little blisters were present when we bought the boat. At that time my initial reaction was pretty glum. Fortunately Kristen and I had already fallen in love with the boat, and we could close our eyes long enough for the boat to be put back into the water, and then just nod our heads like puppets as the surveyor talked about the blisters. OK, they aren’t that bad. In our case there was no structural issues yet, they were just cosmetic. Fortunately they didn’t look any worse this time around, which is what I was fearing. Below are pictures of our hull when we bought the boat a year and a half ago. There were a lot of small, minor blisters. This picture below is what our hull looked like after our haul out in MX and a bit of experimental grinding. Let’s talk about how fiberglass boats in the 1980’s were typically built. Hull molds are negatives of the boat. Builders use these molds to spray in the outside layer of the hull first, then more and more layers are added until the last layer, which becomes the inside of the hull. So, from the outside of the hull in, we have a gel coat, which is just colored polyester resin without any glass fibers. It looks pretty on the outside because the mold is so smooth, like wet paint, and is very durable. Next comes a layer of fiberglass mat, which has the glass fibers randomly going every which way. The following layers are made up of woven fiberglass cloth, which provide for the structural foundation of the hull. The fiberglass mat is used mostly to block the pattern of the woven fiberglass from showing through the gel coat. As each layer of glass fibers is laid down, some sort of two part liquid plastic, often polyester, is smeared over and into all of the glass fibers to lock the glass fibers in place so they cannot move. It is this matrix of plastic and glass that gives a fiberglass hull it’s amazing strength. The blisters that we have are typically called osmotic blisters, although there isn’t really any osmosis, just hydrolysis (water reacting with something). At a super basic level, something my meager mind can just barely grasp, the small water molecules slowly enter the polyester and begin to react with not only the polyester but also with the left over byproducts of the polyester curing reaction. This process is greatly accelerated when there are voids in the polyester, such as when the glass fibers are not completely wetted by the polyester resin, leaving a void where water is attracted, or allowing water to wick along the fiberglass fibers. The water reaction weakens the polyester, and the byproducts of the reaction, mostly glycol and acid, are larger than water and cannot migrate back out of the polyester. 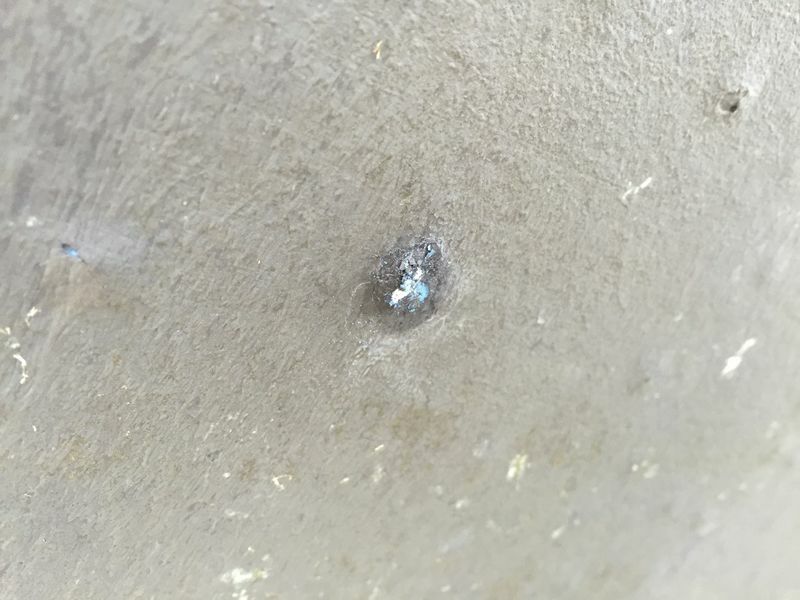 Because the glycol and acid cannot escape, pressure is generated and a blister is formed. 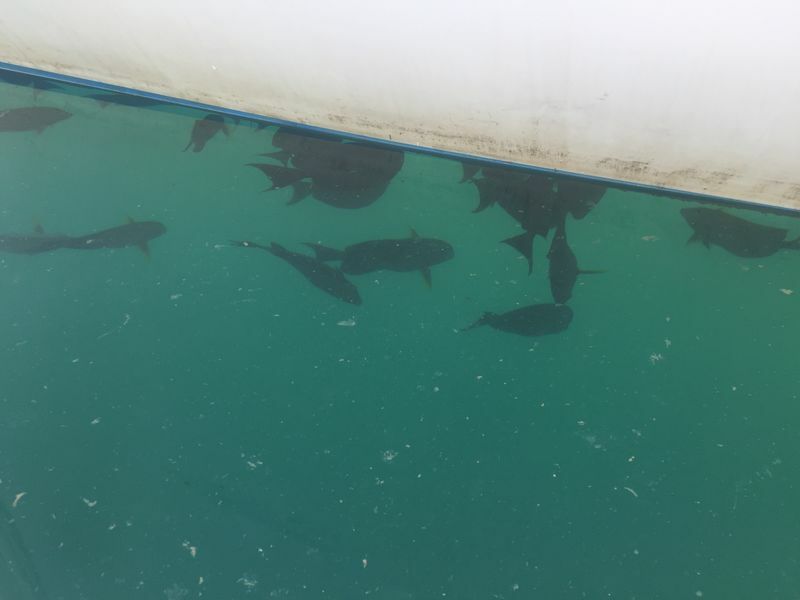 A material more resistant to water ingress than polyester should be used to build plastic boats, like epoxy, but alas, epoxy is much more expensive. Vinylester is a compromise material, with better water resistance than polyester, and cheaper than epoxy. 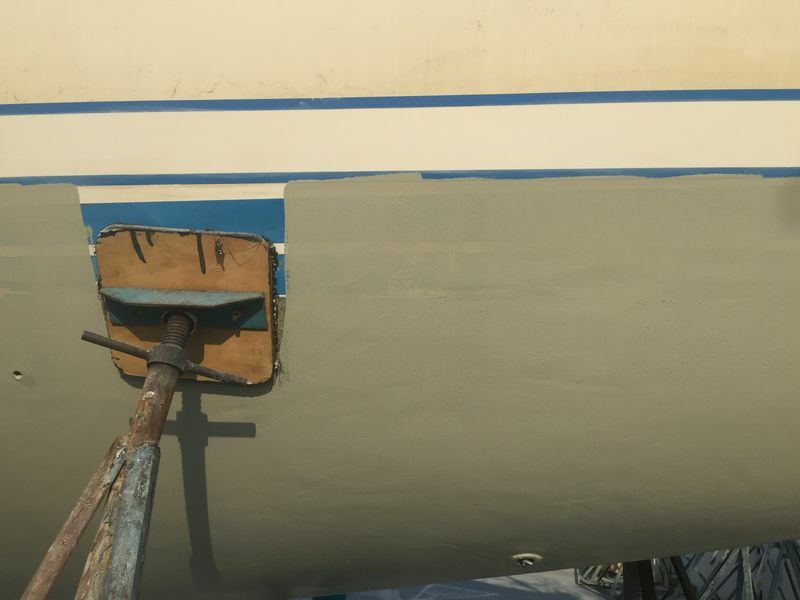 However I think polyester is just fine with a proper application of epoxy barrier coat on the outside, and in the wet parts of the bilge on the inside. Fortunately our blisters didn’t go into the fiberglass mat layer. This is very good! What we settled on as a fix was to grind off all of the gel coat, where the blisters and most of the water and byproduct chemicals likely resided. Then coat the entire hull with an epoxy based barrier coat to prevent further ingress of water. Ideally we would have warm water washed the hull for a week, let it dry in a dry climate for a week or two, and then applied the barrier coat. But we didn’t. Water still in the hull should evaporate out from the inside, greatly accelerated if we can figure out how to promote air movement under the floorboards and behind lockers. Fortunately almost all of our bilge is dry. The parts that are not, should have the barrier coating applied there as well, but alas, that is not happening. 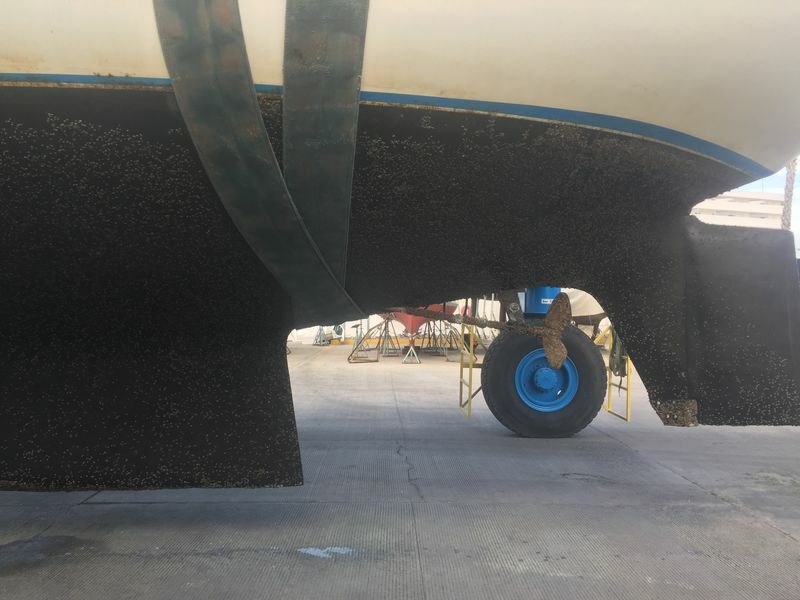 We will rely on thickness of the hull at those deep parts in our bilge, and our super think gel coat that was applied to the inside of the hull. But it isn’t all good. After the first barrier coat was applied, many small voids could be seen. 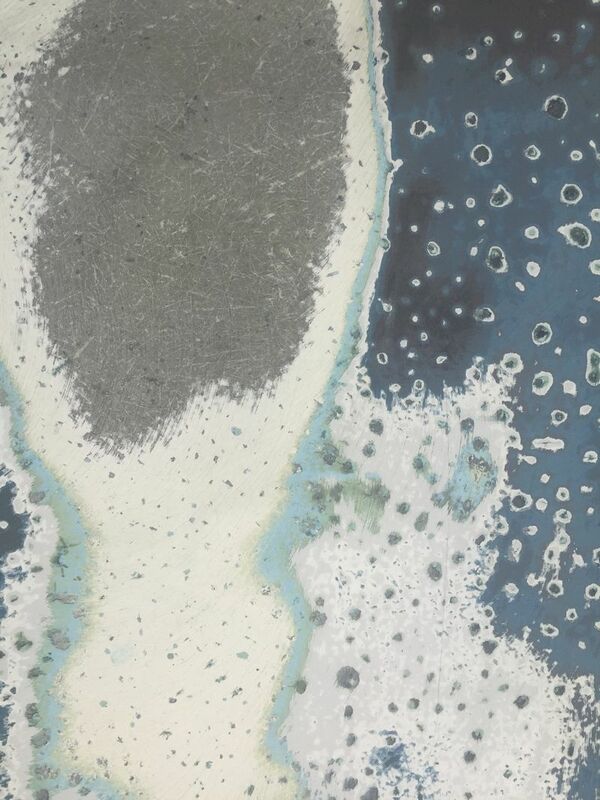 This is the result of the insufficient polyester resin being applied during the fiberglass mat layup. So several barrier coats were applied, and any remaining holes filled with thickened epoxy. 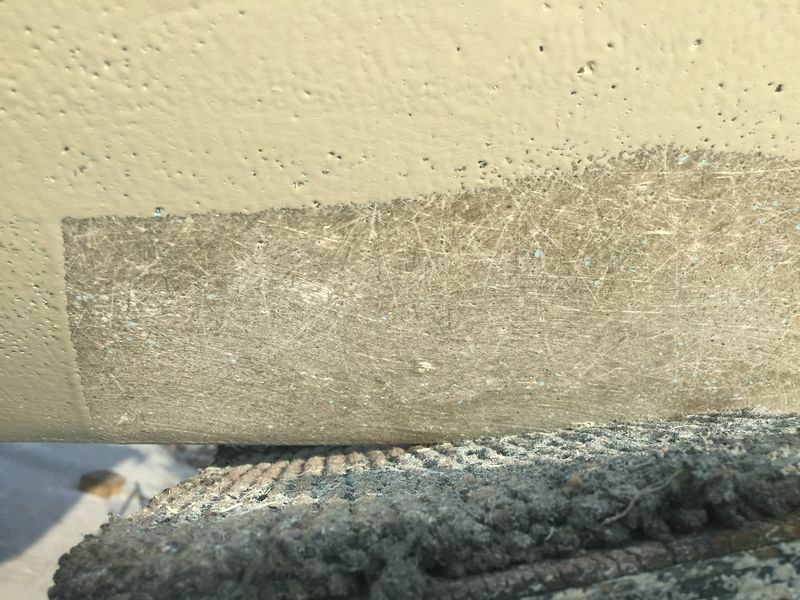 The photo below shows a bunch of little holes in the single layer of barrier coating, and the bare laminate, with fiberglass matting, where the boat stand prevented application of the barrier coating. This next photo shows the waterline being raised. Not good for boat performance, and perhaps safety, but the reality is this is our home, and we haven’t adjusted our things to match the boat. That probably won’t happen anytime soon. Maybe if we cross oceans we will need to deal with this the right way, unloading stuff and reducing weight. After this is all done, a new boot stripe will be painted, new bottom paint will be applied, and back into the water we go. Hopefully this fix will last longer than the life of the boat. I guess we will see, or someone will, ten or more years down the line. 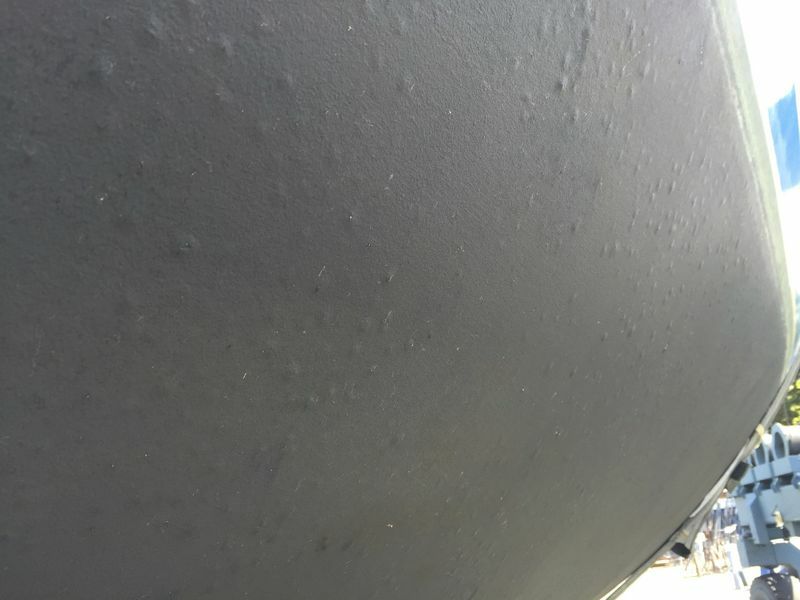 One funny thing about our boat, and this has been typical with other things I have found, is that what looks like an epoxy coat was applied previously, but over a layer of bottom paint! So we had gel coat, bottom paint, epoxy paint, and then more bottom paint. 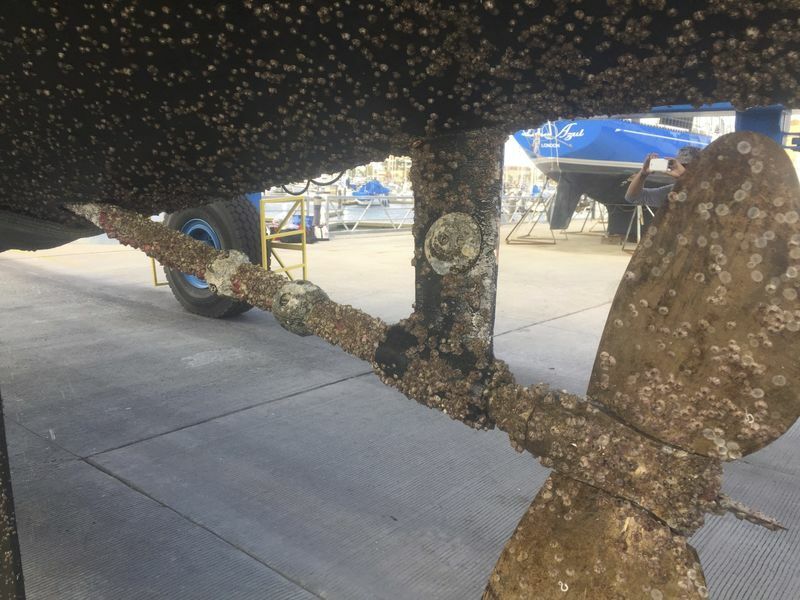 So while we were not very happy about this delay, we are very happy that the blisters haven’t damaged the hull, and that we can take care of this issue. The current launch schedule is January fifth.